David Villarreal, an industrial design graduate student, has been selected as the recipient of this yearâ€™s GlassLab Design Fellowship. The fellowship provides either a graduating senior or a graduating grad student from RITâ€™s industrial design program with the opportunity to explore glass as a medium for the rapid prototyping of ideas and to participate in a two-day GlassLab session at The Corning Museum of Glass. 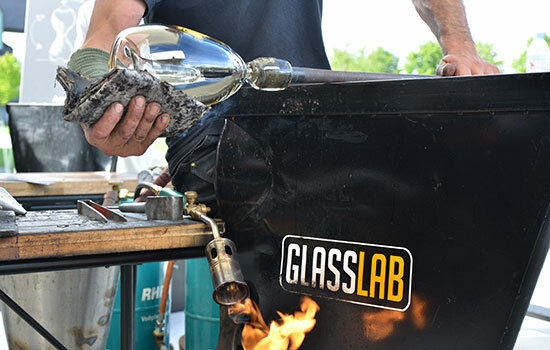 David Villarreal, a graduate student in Rochester Institute of Technology’s industrial design program, has been selected the recipient of this year’s GlassLab Design Fellowship—given annually to an outstanding student in the department. Villarreal, of Fayetteville, N.Y., was named the winner of the fellowship, sponsored annually by Corning Museum of Glass (CMoG), by a faculty panel from RIT’s industrial design graduate program. Since 2013, Josh Owen, professor and chair of the industrial design program in the School of Design in RIT’s College of Imaging Arts and Sciences, has made the announcement of the fellowship winner. Former industrial design graduate students David Strauss, Bridget Sheehan, Tim Copeland, Mehraneh Mirzazad and Michael Kelly won the previous fellowships. The GlassLab Design Fellowship provides either a graduating senior or a graduating grad student from RIT’s industrial design program with the opportunity to explore glass as a medium for the rapid prototyping of ideas and to participate in a two-day GlassLab session at CMoG, scheduled this year for June 6-7. In addition to the CMoG session, the RIT student is eligible to receive transportation reimbursement; an overnight stay in a Corning, N.Y., hotel; a $500 honorarium; and recognition from both RIT and CMoG. According to Owen, the student selected by a panel of RIT industrial design faculty must possess exceptional design skills, excellent communications skills across a wide range of mediums, a high degree of maturity and a strong track record of meaningful contributions to the industrial design program at RIT.